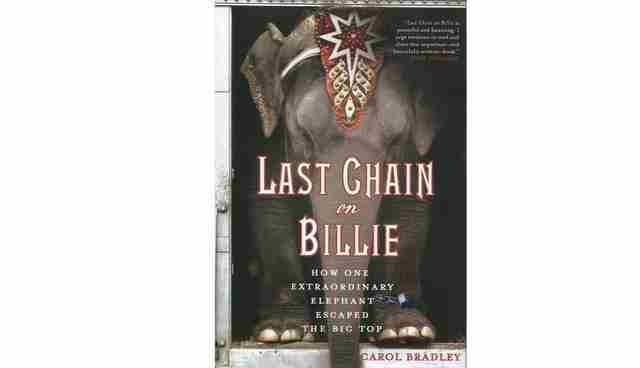 A Tragedy Of Mammoth Proportions: A Review Of "Last Chain On Billie"
Elephants are practically synonymous with the circus. Any animal lover certainly understands that forcing an elephant to stand on her head, or a tiger to leap through a burning hoop, are not activities done at the animal's discretion. But we are told the animals want to perform, that they enjoy obeying their handlers' commands, and we want to believe the lie. As Carol Bradley writes in Last Chain On Billie, nearly all elephant keepers believe the animal must be beaten hard in order to keep the handlers safe. The consequences of repeated beatings often were dangerous "rogue" elephants who killed their attackers and occasionally innocent bystanders. They simply had been beaten one time too many and could not longer contain their fury. One young elephant actually lay down and sobbed after trying desperately to please her trainers who continued to whip her. The animals suffer from post-traumatic stress, and become emotional cripples. And it's true: they never do forget. Bradley writes that by the mid-1980s, groups such as PETA and whistleblowers within the circus industry were publicizing the mistreatment of circus animals. They had hard evidence: videos of horrible abuse and neglect of these magnificent creatures. "Activists urged circus-goers to understand that the only reason elephants scrunched their feet up on tubs and stood on their heads was because they were frightened and intimidated into performing." The message spread. In 2001, The New York Times called circuses "the interspecies version of a minstrel show," and declared them out of step with the more enlightened entertainment available today. Billie, an Asian elephant, was one of the famed Hawthorne Five belonging to the now notorious circus owner, John F. Cuneo. The circus life she was forced into was brutal, unnatural and often deadly. She was referred to by most of her trainers as difficult, and treated with hatred and violence for decades. Mr. Cuneo himself has wracked up a long list of penalties and lawsuits over the last twenty years due to his abusive and neglectful handling of animals. Enforcement of animal welfare laws, however, is weak and ineffective. Cuneo managed to delay proceedings long enough to be fatal to some of his elephants (and other animals as well). But that didn't matter to him. His reason for having animals has always been to make money. So again, greed is the compelling force behind cruelty. Thanks to the Endangered Species Acts in the 1970s, animals who were otherwise considered disposable became much more valuable, and therefore less likely to be executed for bad behavior. But that did not stop of horrific abuse. When whistleblowers began to bring suit against Ringling Bros. and Barnum & Bailey owner, Kenneth Feld, he went to great lengths to destroy the reputation of his attackers, rather than to ensure the health and welfare of his circus's imprisoned elephants. 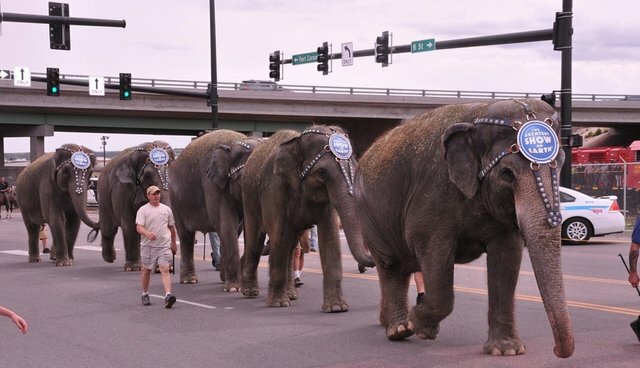 The elephants make more money for Ringling than any of their other enterprises. Felt simply will not give up the profits just for ethical treatment of elephants. Zoos have instigated huge PR campaigns to persuade the public that they serve as important safeguards for endangered wildlife. In truth, some of that wildlife would be less endangered without zoo acquisition. The manner in which they'd come by elephants was brutal enough. But many zoos have attempted to provide an improved facility, and have rescued former circus elephants who became too beaten down to continue entertaining. Billie's story is tough to read, even though it does have a happy ending. Her rescue was one of the successes, thanks to the Elephant Sanctuary. Other animals have been rescued by Pat Derby's PAWS and other dedicated, hard-fighting folks who will not give up the war against animal abuse. But it is imperative that every animal lover does read about Billie and that the names of some of the biggest culprits remain forever forefront: John F. Cuneo, Kenneth Feld, and dozens of circus owners and handlers who have repeatedly thumbed their noses at the animal welfare laws and continue to mistreat and exploit this magnificent creature are exposed here in all of their ugliness. John Cuneo continues to enjoy a life of leisure and splendor that his brutal exploitation of elephants and other wild animals has provided. His name should be synonymous with animal cruelty, not with Loyola University's Cuneo Hall. The best thing we bystanders can do is keep spreading the word, stay informed, and support those who are in the fight as much as possible. More important, we should no longer accept the use and abuse of wild animals for profit. Circuses are not "good, wholesome family entertainment," as Kenneth Feld proclaimed. They are dark, dank pits of violence and cruelty. If the audience stops paying, perhaps the cruelty will finally end. Go to elephantsanctuary.com for more information about their wonderful work. And to Performing Animal Welfare Society or PAWS at www.pawsweb.org. And when the circus comes to town, think of Billie. Find Last Chain On Billie and other good reads for animal lovers at www.booksforanimallovers.com.